BlackBerry CEO Thorsten Heins presenting the new BlackBerry Z10 (left) and the Q10. BlackBerry has unveiled its completely new mobile operating system and launched two new smartphones but the revamped devices won't hit Australian shelves until sometime in March, it was revealed today. The Canadian giant also announced it was rebranding its company name from Research In Motion (RIM) to a single "BlackBerry" brand. The "reinvention" of BlackBerry 10 software will feature on two new smartphones that were announced at multiple press events across the globe overnight. The hero BlackBerry Z10 device has a 4.2in touchscreen, while the BlackBerry Q10 features a touchscreen and a physical QWERTY keyboard, a more traditional BlackBerry form factor. Both are 4G capable smartphones and will be available in black and white variants. The BlackBerry Z10 will be available from tomorrow in the UK, from 5 February in Canada, and from 10 February in the United Arab Emirates (UAE). However, it won't be available in Australia and the US until "sometime" in March. The BlackBerry Q10 won’t be released in Australia for several months. BlackBerry today confirmed that Australia's two largest telcos, Telstra and Optus, would both sell the new Z10 smartphone from March, but pricing and specific availability dates were not announced. The new BlackBerry Z10 smartphone. BlackBerry's new operating system and smartphones are a last ditch attempt by the company to win back market share from Apple's popular iPhone and Google Android devices, which dominate the smartphone market both in Australia and across the globe. "To say that we're excited about arriving at this point today is a massive understatement," said BlackBerry Australia's managing director, Matthew Ball. "We are very confident with the product, we've engaged appropriately with our top customers, our carrier partners and we're in a position to say we're launching." Ball admitted the company has a tough challenge to sell the devices against popular competitors, but said BlackBerry may have an advantage with its all-new operating system. "It think its fair to say that the existing BlackBerry operating system has been taken as far as it can be," he explained. "I think every single last drop of development capability was squeezed out of that platform and its time to move on." "I think many of our competitors are going to be facing that time soon. We are in an enviable position in that we are launching a brand new platform, we are not bolting new features onto existing architecture. We are putting a brand new platform in place that we are able to tweak and build as we go and as we evolve," he said. The new BlackBerry 10 operating system uses a gesture-based interface, which is a departure from previous BlackBerry products. 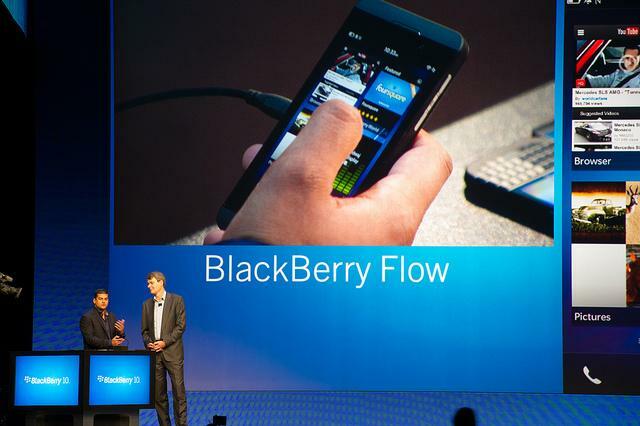 The software utilises a central "BlackBerry Hub" to manage all messages and notifications, has an advanced multitasking feature called "BlackBerry Flow" and includes a new touch screen keyboard that the company says will learn and adapt to your keystrokes to offer word suggestions and predictions while typing. Ball explained that that company attempted to include the features its customer based liked about past BlackBerry devices and improve features that people didn't like, such as a lack of third-party applications and a below par Web browser. "The user experience is critical," he explained. "The things that people love about BlackBerry were the security, the speed and the email functionality. The things that people didn't like were the lack of applications and the browser experience. 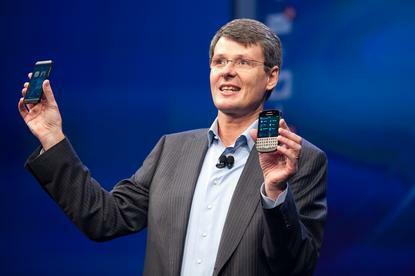 What we've done is taken the essence of BlackBerry and reinvent it for 2013 and beyond," he said. The BlackBerry 10 operating system being demonstrated at a launch event in New York. Local Australian apps that have been announced for the BlackBerry 10 platform include Event Cinemas, goCatch, Fox Sports, Quickflix and Fairfax, while a number of big name global applications have been confirmed including the likes of Facebook, Twitter, LinkedIn, Foursquare, Skype, Rdio, Whatsapp Messenger, Evernote, Dropbox and TuneIn Radio. Available games at launch include popular titles like Angry Birds, Jetpack Joyride, Cut the Rope, Fruit Ninja and Modern Combat 4. Ball confirmed that BlackBerry will aim for an "ideal ratio" of 45 per cent consumer customers in Australia within the first twelve months, saying the company's targets are both "significant" and "ambitious". "About two thirds of our current Australian customer base are enterprise customers and about one third are consumer customers," he said. "Our intention with BlackBerry 10 is that we expand significantly our footprint into the consumer market as well as maintaining our growth in the enterprise market." "I think for us the ideal ratio is around the 45 per cent consumer base and 55 per cent business in the first year at least. There is no doubt about it, our growth targets locally are significant and ambitious." Telstra and Optus are expected to announce specific details of the BlackBerry Z10 smartphone in the coming weeks.